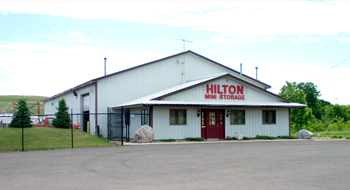 Hilton Self Storage is a locally owned and operated storage facility that was originally established in 1983 and conveniently located between Inver Grove Heights, Eagan and Rosemount suburbs. We provide a quality storage facility that is clean and secure with 24/7 key card access to allow customers easy access to their storage spaces. As local residents our home is located within minutes of the storage facility for frequent monitoring and appointments. It is our priority to create good business relationships with our customers and our community. Supporting our community we are members of the following organizations. We have stored our trailer and a couple cars at Hilton Self Storage for the past two years. I have known the Fischer's to be friendly and very helpful. Their location has easy access from the road, secure fencing, good lighting at night; all at a fair and competitive price. I would highly recommend them to anyone who is thinking about using their storage facility. I feel very good when I leave my RV at Hilton Storage, it is very secure and safe.